were quite excited by the number. After a closer look we noted elephants as far as the eye could see. We drove for around three or four kilometres with family after family of elephants approaching us, while still others had crossed the road and were disappearing into woodlands. 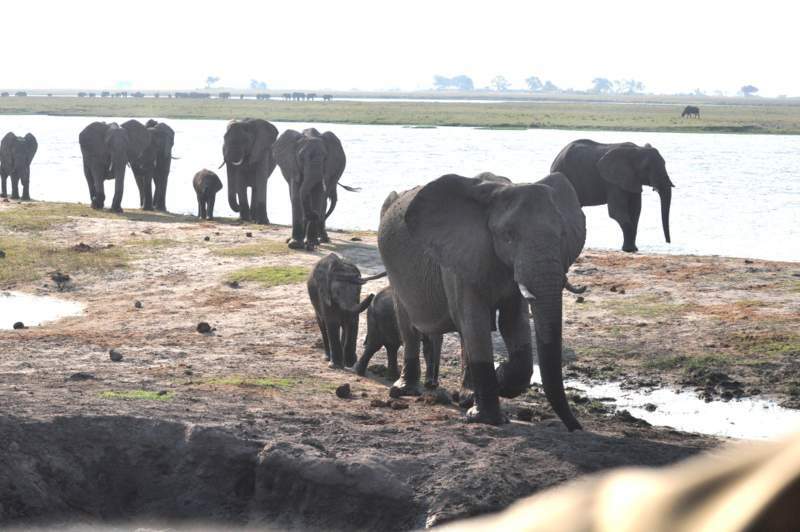 declared it the largest group of elephants he had seen in fourteen years as a guide. This entry was posted in Africa, Botswana, Photography, Postaday, PostaWeek, Travel, Travel Theme, Wildlife and tagged Digital photography, elephants, nikon d90, postaday, Savuti, Travel, Travel Theme. Bookmark the permalink. So gorgeous. And well captured! It was a gorgeous sight, however, my photography let me down that day…or I have not found the photos of scenes I remember and thought I photographed. It was a spectacular sight. However, I was sure that my photography had included better photos than these. I think your photos portrayed the scene and atmosphere beautifully Woolly. I can feel how hot it was next to the water! Then I shall gracefully accept the compliment…with many thanks. It is a memory that will not fade for many, many years. Near the end of our trip our guide said that we had probably sighted over 3,000 elephants in total. While each and everyone was special, nothing will take away the memory of such a large number of elephants in one place. I always thought those sightings were something one saw on a wildlife documentary. Breath taking.